The Penguins, Seals and PIE Pass is the easy way to enjoy Phillip Islands’ nature, wildlife, fun, entertainment and chocolate. 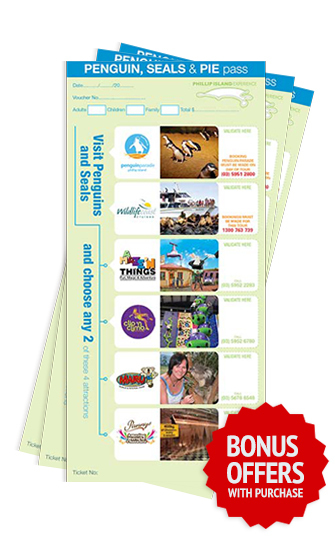 Just purchase your Penguin, Seals & PIE pass and present the ticket at the Penguin Parade and Wildlife Coast Cruises and the 2 attractions you most wish to see. If you have purchased your Phillip Island Experience pass online, just print out the Rezdy ticket (which you will recive via email) and present it at the first PIE attraction you visit. Please note: Seal cruise times and dates visit www.wildlifecoastcruises.com.au/seal-watching-cruise/, it’s advised to pre-book your Seal Watching Cruises on the day of tour or earlier, call 1300 763 739.